With the number of electronics applications requiring low power performance continuing to rise, IQD has launched the new IQXO-610, a 32.768kHz clock oscillator with ultra low current draw down to 1µA typical with no load at 3.3V and 1.5μA typical at 5V no load. 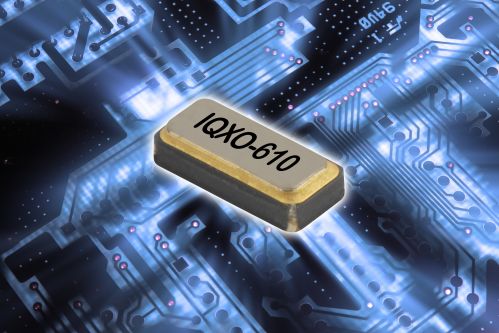 The IQXO-610 is able to deliver superior stability performance due to compensation of the frequency and temperature characteristics of the 32.768kHz crystal. This allows the new model to offer stabilities down to ±20ppm over an operating temperature range of 0 to 50 degrees C and ±50ppm over -40 to +85 degrees C.
Packaged in a 3.2 x 1.5 x 0.9mm hermetically seam sealed package with a metal lid, this CMOS based clock oscillator is capable of driving up to 15pF loads and can operate over a wide voltage range from 2.0V to 5.5V. An enable disable function is available on Pin 1 of the device with a current draw in disable mode of 0.6µA. Typical applications include real time clocks, IoT applications, precision timing devices, event data recorders, smart meters (AMR) and wearable devices where the reduction in power consumption is critical. Full data sheets are available on IQD’s website at www.iqdfrequencyproducts.com.